Faicel Jaballah claimed two titles at the African Judo Championships in Tunis as hosts Tunisia topped the medals table with five golds in all. The 2013 world bronze medallist won both the men’s open weight class and the men’s over 100 kilogram division, finishing ahead of Cameroon’s Dieudonne Dolassem and Algeria’s Mohammed Amine Tayeb respectively at the Sportshall El Menzah. 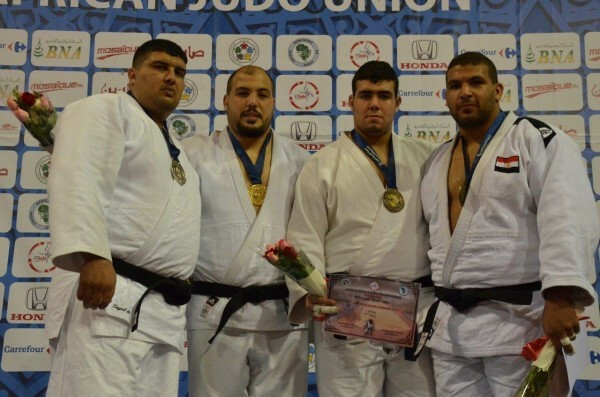 Algeria’s Mohamed Sofiane Belrekaa and Cameroon’s Seidou Nji Mouluh came third in the men’s open weight class, while Algeria’s Mohamed El Mehdi Lili and Egypt’s Ahmed Wahid were the men’s over 100kg bronze medallists. There were also gold medals for the host nation thanks to Hela Ayari in the women’s under 52kg, Meriem Bjaoui in the women’s under 63kg and Nihel Cheikh Rouhou in the women’s over 78kg. Ayari bested Algeria’s Meriem Moussa, who was followed onto the podium by compatriot Faiza Aissahine and Ivory Coast’s Salimata Fofana. Bjaoui overcame Morocco’s Rizlen Zouak as Algeria’s Imene Agouar and Ghana’s Szandra Szogedi took bronze, while Cheikh Rouhou got the better of Algeria’s Sonia Asselah with Senegal’s Monica Sagna and Cameroon’s Nadine Wetie Diodjo rounding out the medallists. Surprise package Egypt finished second in the medals table after racking up four golds, all of which came in men’s competition. Ahmed Abelrahman denied Tunisia’s Fraj Dhouibi top honours in the under 60kg before fellow Egyptian Mohamed Mohyeldin downed Morocco’s Ahmed El Meziati in the under 73kg showdown. Mohamed Abdelaal defeated Ali Hazem in an all-Egyptian under 81kg final, while Ramadan Darwish saw off the challenge of Algeria’s Lyes Bouyacoub to take under 100kg gold. Algeria, Cameroon and Morocco won two gold medals each and were followed in the standings by sixth-placed Guinea-Bissau, whose sole gold medal came through Taciana Lima in the women’s under 48kg. The African Judo Championships provided valuable qualification points for Rio 2016. Angola's Antonia Moreira and Algeria's Houd Zourdani, bronze medallists in the women's under 70kg and men's under 66kg respectively, were among those to secure Olympic berths as a result of their performances.